The Palestinian BDS National Committee has called for a Global Day of Action to commemorate Palestinian Land Day. On March 30, 2011, join the international campaign to Stop the Jewish National Fund. Palestinian Land Day is the annual commemoration of the 1976 general strike and marches against massive land expropriation by Israel in which six Palestinians were killed and hundreds of others were jailed and wounded.Since then it has been a day to recall many decades of Palestinian resistance to historic and on-going displacement and dispossession. A key pillar of the colonization of Palestine – from the founding of the State of Israel to the present – has been the Keren Kayemet LeIsrael (KKL), commonly known in English as the Jewish National Fund (JNF). The JNF enjoys charity status in over 50 countries. This is despite its role in the on-going displacement of indigenous Palestinians from their land, the theft of their property, the funding of historic and present-day colonies, and the destruction of the natural environment. Join the campaign to Stop the JNF. The campaign is already underway in Britain, Canada, France and the US, and challenges to the JNF continue across Palestine, including in Israel. 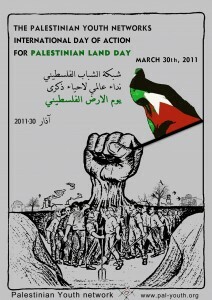 The campaign to challenge the JNF will launch on Land Day 2011. As part of the global movement for Boycott, Divestment and Sanctions (BDS), in solidarity with the Palestinian liberation struggle, and until such time as the State of Israel respects and implements international law, we call on global civil society to join in a campaign to challenge the JNF.